In ancient Greece, Muses were beautiful goddesses who inspired great creativity in literature, painting, dance, and music. A visit from the Muses, along with their gifts of inspiration and genius, were coveted by every artist with a vision. Great poets lusted after the perfect words; artists dreamed of the right shades and subtle tones; and musicians yearned to hear lithe melodies and swelling harmonies. Inspiration was a gift the Muses bestowed upon you, often without warning. The Muses would visit as they pleased, blessing a sacred few with true beauty while ignoring the pleas of the struggling or desperate. The Muses were wild and untamed, never to be controlled or willed upon. Nevertheless, many great poets would call upon the Muses in their work, hoping to be blessed with their gifts of wisdom and virtuoso as they put pen to paper. Of all the gods and goddesses, the Muses were revered by the artists above all. In my own occasional pits of creative despair, I have no trouble believing this affirmation. Often my photography simply refuses to match the beautiful images I've conjured up in my mind. The beauty is lost in translation somewhere between my vision and the click of the camera's shutter. Words escape my fingers when I sit down to write. Sometimes I imagine that if I can ever express something so succinctly, so accurately, I can hang up my apron and my work will be done. Yet, I feel the Muses grant no one that pleasure. Even so, I feel the Muses heard Homer's call when he composed The Odyssey, blessing him with the expression "child of morning, rosy-fingered Dawn." Years later, this simple phrase still sends a shiver through my mind—I could not write such a perfect description if I lived a thousand years. Despite my personal struggles with the mythical Muses, I like to imagine they hold a real presence in this world. For anyone who pursues artistry, knowing the Muses are out there is like taking a collective sigh of relief. The Muses take away the responsibility of creativity or genius from ourselves. They bestow these gifts alone. If the words do not flow, I am not to blame. If another one of my recipes fails extraordinarily, the Muses must have certainly played a hand. And, if the photographs of this Flourless Chocolate Rum Cake don't quite measure up to the images swimming about my head, we can always blame the Muses. Perhaps they have taken the day off. 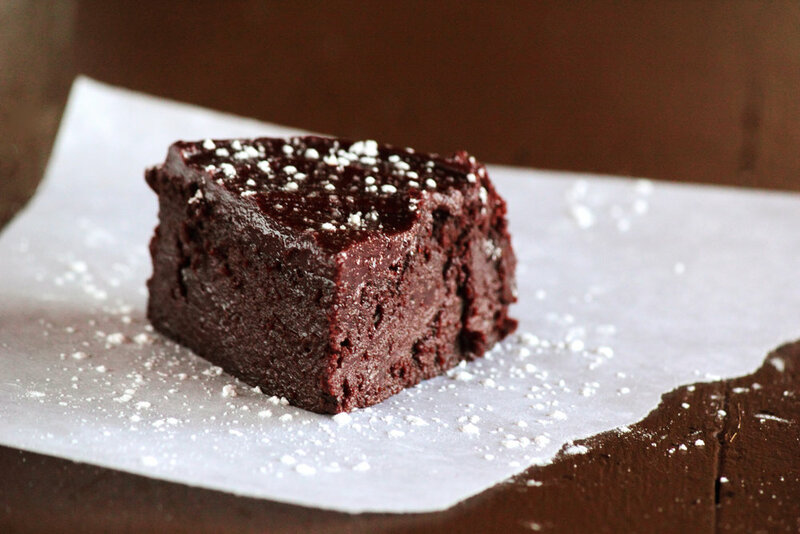 This Flourless Chocolate Rum Cake melts in your mouth like a rich, chocolate truffle. The cake itself is flourless (this is for you, gluten-free friends!) and sets using eggs and a hint of cocoa powder. With a heavy shot of rum, this cake is not for the kids. The alcohol does not bake out of the cake and your nose may feel a little tingly after the first bite. Imagine a chocolate rum truffle, make it just a little bit lighter in texture, and you have this sinful cake. If you want to eliminate the rum, simply substitute it with 1/3 cup water. Preheat oven to 375 degrees F (190 degrees C). Grease an 8-inch baking pan and set aside. In a small saucepan over low heat, melt together chocolate and butter, stirring until smooth. Remove from heat, transfer to a mixing bowl, and mix in the sugar. Beat in the eggs one at a time, mixing until smooth between each addition. Stir in the vanilla extract, cocoa powder, and rum until well mixed. Pour batter into prepared pan and bake for 25-30 minutes, or until a toothpick inserted into the center comes out relatively clean with a few crumbs. Do not over-bake or the cake will become dry. Allow cake to cool in pan for 5 minutes before inverting onto a serving plate. In a small saucepan, melt together chocolate and butter, mixing until smooth. Stir in the rum. Spread evenly over cooled cake.